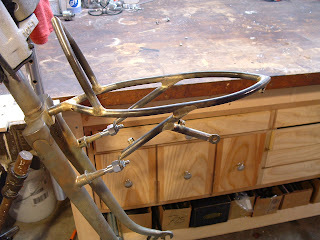 Spent the day working on the front rack for Travis' rando bike. 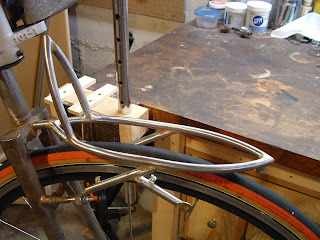 I've been cogitating about this project for quite awhile, and here's what I came up with. 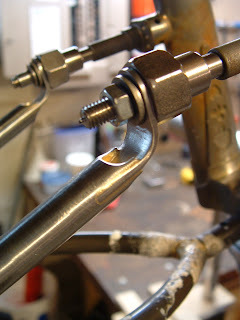 I bent the main tubes of the rack platform on my fork bending ramp, then mitered the ends and brazed it flat with the tips overhanging the bench. 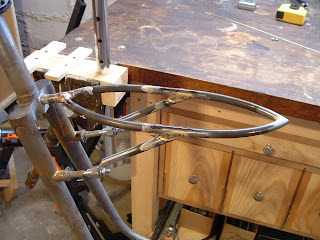 I made some struts, mitered them and now it's fluxed and ready to braze. 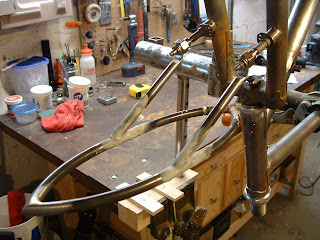 Here it is with the struts brazed in and waiting for the back "tongue". 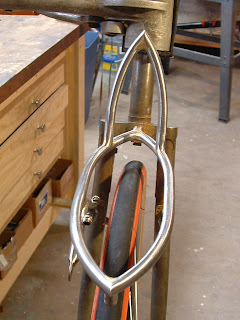 Fully brazed up with the light mount, wiring guides and fender mount at the tip. Wow! It turned out super clean, I am loving the shape.